The GPES-30’s new radius traverse function expands grinding capabilities. The GPES-30 CNC eccentric/polygon grinder provides both automatic roundness on the eccentric shaft and superior accuracy on polygon shapes. 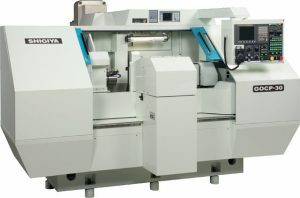 It sculpts the required geometry for diverse polygonal workpieces and custom polygon applications used in the manufacture of hub connections, keyways, gears, couplings and splines.